Jeffrey’s Tonic began with a book. And that was all the inspiration that Mike and Maureen needed to take on their adventure in developing their own tonic syrup. While tonic syrups have become quite common in the United States, there’s vastly fewer on the market in the U.K. where Mike and Maureen live. Jeffrey’s Not so Plain Tonic Syrup— one of four in their range— highlights Cinchona bark with a dash of Sicilian Lemon juice (natural partners IMHO). But what really caught my attention among the ingredients for Jeffrey’s Not so Plain Tonic Syrup was sea salt. When many other tonic syrups descend into cloying sweetness, seeing salt on the back almost seemed like an A-ha! to me. Poured straight from the bottle on its own, Jeffrey’s Not so Plain Tonic Syrup has a moderate viscosity. The bitterness is solid and pucker-worthy on the front of the palate but the finish is impressively dry. You certainly can tell that there’s salt in here. It almost mutes the sugar. With soda, the first thing you’ll notice is the viscosity demands it be stirred in a bit. Clean quinine early, mid-palate is somewhat dry while the finish is terse and heavy with the quinine notes and earthy cinchona bark. While the lemon is subtle— almost to the point of absence— the salt amplifies the quinine notes. As a tonic syrup and soda, this is really nice. I then mixed Jeffrey’s Not so Plain Tonic Syrup in a G&T with Stroudwater Gin in a 3 parts soda, 2 parts gin, 1 part syrup ratio. Clean juniper early with the bulk of the tonic syrup’s sweetness is concentrated at the fore. Mid-palate the quinine takes over, seguing into a long and mellow finish, highlighted by some sweet wood notes. It certainly has more sticking power than your average tonic water. But Jeffrey’s Not so Plain Tonic Syrup, while still being sweet as a tonic syrup is and should be, it manages to be “not as sweet as you would expect.” As in, it’s nicely balanced. Never cloying. I’m a big fan of what Mike and Mo have done here. 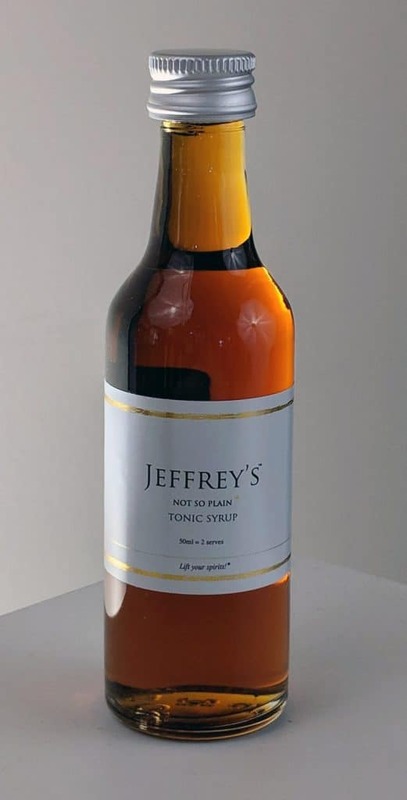 Jeffrey’s Not so Plain Tonic Syrup is a sign that the tonic syrup market is maturing. If you don’t like tonic syrups, it unfortunately may not change your mind— however, it’s worthy of note for the balance, it’s use of culinary technique to achieve that balance— and truth in advertising. It’s not-so-plain. It’s really quite good.